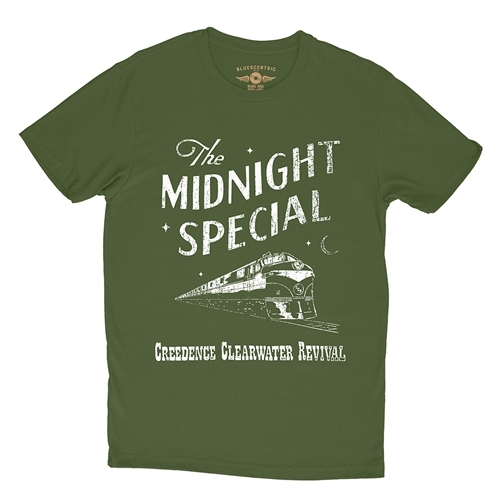 Officially licensed Creedence Clearwater Revival Midnight Special T-Shirt, the design is distressed. While the prison song about waiting for the midnight train bringing loved ones to visit wasn't first written or recorded by Leadbelly, the blueman's 1934 version was arguably the most impactful. Probably because it was recorded while he was serving time in Louisiana's notorious Angola Prison. Then Creedence Clearwater kicked up the tempo and belted out a swampy rock n roll hit with their cover of Midnight Special -- one of several smash hits on their 1969 album Willy and the Poor Boys. This Bluescentric Brand official Creedence Clearwater Revival t-shirt is available in premium lightweight 4.2oz vintage style sizes up to 4XL. Solid colors are 100% combed, ringspun cotton. Athletic Heather is 90% cotton. All other Heather colors are 52% cotton, 48% poly. Sizes run true. These t shirts are lighter and slightly more fitted compared to the Classic Gildan tees. Let the midnight special shine a light on me!